Liverpool manager Jurgen Klopp hopes talk of Mohamed Salah’s early-season slump will be quashed by the Egyptian’s double in a 4-0 win over Red Star Belgrade on Wednesday that took his tally for the club to 50 goals. Salah ended a four-game goal drought with the winner at Huddersfield on Saturday and looked more like his old self in scoring either side of half-time. Roberto Firmino and Sadio Mane were also on target as Liverpool’s prolific front three that led them to the Champions League final last season all scored in the same game for this first time this campaign. Salah has reached his half-century quicker than any other player in Liverpool history after just 65 appearances for the Reds. “It’s great, I’m happy to score my 50th goal,” said Salah despite his muted celebrations. “We know how to play with each other and know our qualities,” he added of his combination with Firmino and Mane refinding its spark. Liverpool are now back on top of Champions League Group C as Paris Saint-Germain and Napoli drew 2-2 in the French capital, but all three sides remain separated by just two points. Liverpool had struggled for goals in recent weeks with a new-found defensive stability instead keeping them level on points with Manchester City at the top of the Premier League. Klopp tinkered with his preferred 4-3-3 system by moving Salah centrally as the focal point of a 4-2-3-1 and his decision to hand Xherdan Shaqiri a start paid off as the Swiss added some much-needed creativity in midfield. Shaqiri’s pass played Andy Robertson in behind the Red Star defence and his cross was converted by Firmino for his first goal in eight games to get Liverpool off the mark. Salah then took centre stage to take his tally for the new season to six despite a slow start sparking concern he would not meet the standards of his incredible 44-goal debut campaign at Anfield. He fired home from another neat touch by Shaqiri to give Klopp’s men breathing space before half-time and then from the penalty spot after German referee Daniel Siebert awarded a very soft spot-kick for Filip Stojkovic’s challenge on Mane. 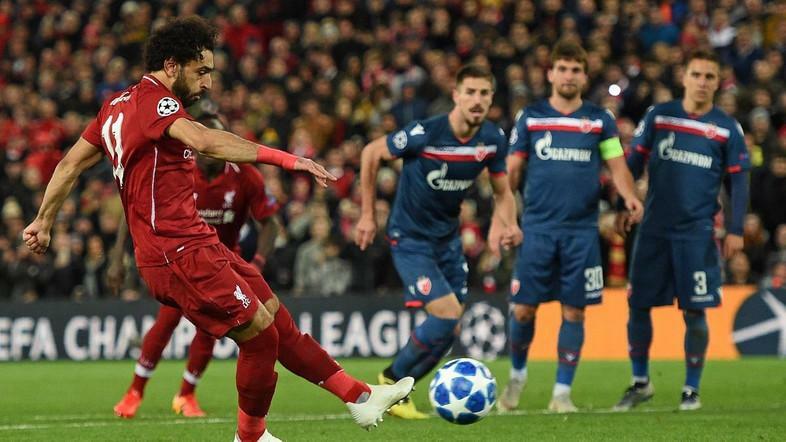 Klopp then withdrew Salah before Liverpool’s second penalty of the night to rob him the chance of a hat-trick when Milos Degenek handled inside the area. Mane missed his opportunity in Salah’s absence as Milan Borjan turned his penalty onto the crossbar. However, the Senegalese made amends 10 minutes from time by stabbing home Daniel Sturridge’s pass.